When you have this specific issue, the likely reason is that you don't have curl set up properly. There are a number of plugins available to help you integrate Login with Amazon (LwA) into your website. One of these is the LwA plugin for WordPress. 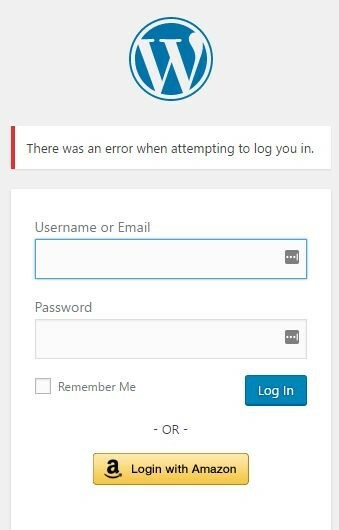 If you allow users besides yourself to log in to your WordPress installation, it can be useful to let them use their Amazon credentials to log in, giving them one less ID/password combination to remember. In the Plugins section of your WordPress control panel, select “Add New”. On the “Add New page”, search for "Login with Amazon". Login with Amazon (LwA) allows your customers to log in to your website or app using their Amazon credentials. LwA uses the OAuth 2.0 protocol making integration easy, and allows you to provide a more personalized user experience such as greeting visitors by name or displaying customized offers based on zip codes. Depending on the permissions you request as part of this authentication (and what the user approves), LwA returns information you can use to connect to different Amazon APIs and obtain information about the user, perform tasks on their behalf, and/or incorporate Amazon services into your interactions with them. When a user opts to use Login with Amazon to log into your site, you have to send them to an Amazon controlled page where they enter their email and password. This provides assurance to the user that you are not peeking at their password. When a user completes a login and approves the permissions you requested, the main browser window is redirected to a URL of your designation with information embedded in the URL. Since 2013, Login with Amazon has provided an OAuth 2.0 protocol authentication system that allows websites and mobile apps to securely connect with more than 250 million Amazon customers. Now we’ve streamlined the login experience for those customers, adding new support for single sign-on across multiple platforms. We’ve also introduced new plugins to make it easier than ever to use Login with Amazon from your website. These new features are part of our ongoing efforts to bring more value to our developer community. We’re proud to announce that, with the release of the latest Login with Amazon SDK for iOS (v.2.1.0), single sign-on is now supported across web, Fire tablet, Android, and iOS applications. Login with Amazon provides a single sign-on experience by automatically authenticating customers using the Amazon account they’re already signed into. Customers who click Login with Amazon on your website are automatically signed in if they’re also signed into Amazon.com in the same browser session. On Fire tablets, Login with Amazon uses the Amazon account registered to the device for authentication. On Android and iOS, the account signed into the Amazon Mobile Shopping app is used for authentication. See Introducing 1-Click Sign In on our website for more information. Login with Amazon is now available to developers to integrate in their mobile apps and websites. The new service lets you take advantage of the same user authentication system used by Amazon.com. Login with Amazon allows you to securely recognize millions of Amazon customers and provide them with a personalized user experience. For example, you can greet visitors by their name or display customized offers based on their zip code. Login with Amazon uses the OAuth 2.0 protocol making it easy for you to integrate it in your app or website. Developers who have previously worked with the OAuth 2.0 protocol will find the terms and concepts straightforward and consistent with other implementations. How does Login with Amazon work? The user visits your website or app and clicks the Login with Amazon button. The user is presented with a login screen hosted on Amazon.com. The user enters their Amazon credentials. First-time users will see a consent screen hosted on Amazon.com to grant your site permission to specific pieces of information. After the user consents, your app will be able to securely access customer profile data (name, email, zip code) to create a new user account and provide a personalized user experience for them. Login with Amazon SDKs are available in public beta for Android, Kindle Fire, and iOS. To integrate the service in your app or website, go to login.amazon.com to register a developer account, download the SDKs, and view the Getting Started Guides. Login with Amazon adds yet another capability for mobile app developers. Now, developers can use Amazon Web Services (AWS) for its infrastructure (e.g., compute, storage, and database). For those interested in building cloud-backed apps, you can read more about it here.